1 Departamento de Bioquímica y Biología Molecular, Facultad de Ciencias Químicas y Farmacéuticas, Universidad de Chile. PO Box 233, Correo 1, Santiago, Chile. 2 Centre for Human Immunology, Department of Microbiology and Immunology, Siebens-Drake Research Institute, The University of Western Ontario, London, Ontario N6A 5C1, Canada. Shigella flexneri causes bacillary dysentery in humans. Essential to the establishment of the disease is the invasion of the colonic epithelial cells. Here we investigated the role of the lipopolysaccharide (LPS) O antigen in the ability of S. flexneri to adhere to and invade polarized Caco-2 cells. The S. flexneri 2a O antigen has two preferred chain lengths: a short O antigen (S-OAg) regulated by the WzzB protein and a very long O antigen (VL-OAg) regulated by WzzpHS2. Mutants with defined deletions of the genes required for O-antigen assembly and polymerization were constructed and assayed for their abilities to adhere to and enter cultured epithelial cells. The results show that both VL- and S-OAg are required for invasion through the basolateral cell membrane. In contrast, the absence of O antigen does not impair adhesion. Purified LPS does not act as a competitor for the invasion of Caco-2 cells by the wild-type strain, suggesting that LPS is not directly involved in the internalization process by epithelial cells. Species of the genus Shigella cause bacillary dysentery in humans, an acute intestinal infection characterized by bloody diarrhoea due to an intense inflammatory reaction accompanied by destruction of the colonic mucosa (Schroeder and Hilbi, 2008). An essential step to establish the disease is the invasion of the intestinal epithelial cells followed by bacterial multiplication and spread into adjacent cells. In the initial phase of infection, Shigella is transcytosed across M cells reaching the submucosa, and then free bacteria invade epithelial cells from the basolateral side (Schroeder and Hilbi, 2008). The invasive capacity of Shigella depends on proteins encoded in the large virulence plasmid (Parsot, 2009). This region contains more than 30 genes organized into two clusters: the mxi-spa locus that encodes the components of a type three secretion system (T3SS), and the ipaBCDA locus that encodes effector proteins that are translocated through the T3SS and cause cytoskeletal rearrangements that promote bacterial ingestion (Parsot, 2009). The expression of Shigella virulence genes is controlled by environmental conditions prevalent in the large intestine (Dorman and Porter, 1998); however, full activation of the secretion system is triggered upon contact of Shigella with the host cells (Parsot, 2009). Thus, early interactions of bacteria with epithelial cells must take place before invasion can occur. Nonetheless, the nature of these interactions is not completely understood. O antigen (OAg), which is exposed to the cell surface (Raetz and Whitfield, 2002). 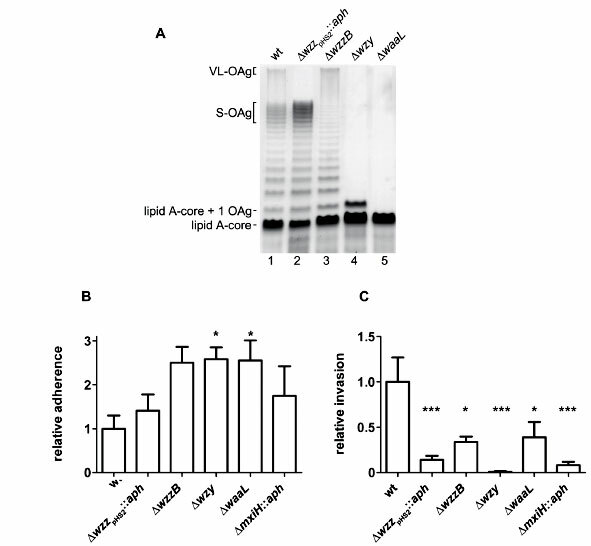 The LPS of S. flexneri 2a has O-antigen molecules with two preferred chain lengths, a short or S-OAg composed on average of17 repeated units (RU) that is regulated by a chromosomally-encoded WzzB protein, and a very long or VL-OAg of about 90 RU that is regulated by WzzpHS2, which is encoded in plasmid pHS2. The role of LPS in the invasion process of Shigella is unclear. Early reports using spontaneous or transposon-insertion mutants lacking O antigen or with truncated cores indicated that neither a complete core nor the O antigen is required for S. flexneri entry into HeLa cells (Okamura et al., 1983; Okamura and Nakaya, 1977; Rajakumar et al., 1994; Sandlin et al., 1995). More recently, a study conducted with mutants that were identified by signature-tagged mutagenesis indicated that a strain lacking O antigen was able to invade HeLa cells; however that work also showed that glycosylation of the O antigen enhances bacterial invasion, suggesting that a polymeric O antigen is necessary to this process (West et al., 2005). Only one study has addressed the role of LPS in the interaction of S. flexneri with polarized epithelial cells. Using mutants obtained by Tn10 insertion, Kohler et al. (2002) found that adhesion to polarized human T84 colonic epithelial cells requires the presence of polymerized O antigen. In this study, we have investigated the role of the O antigen in the ability of S. flexneri to adhere to and invade polarized Caco-2 cells, using a series of mutants with defined, non-polar deletions of the genes required for the assembly and polymerization of the O antigen. Our results indicate that polymerized O antigen is necessary for internalization and, moreover, a normal chain length distribution of the O antigen is required for the invasive process. 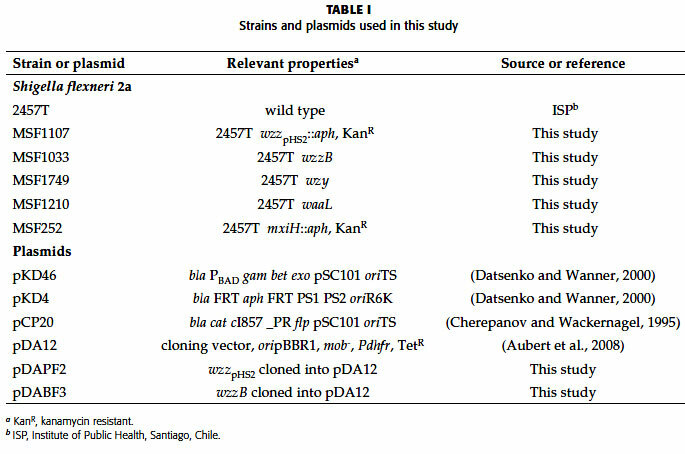 Table I summarizes the properties of the bacterial strains and plasmids used in this study. Bacteria were grown in Luria-Bertani medium (LB) (10 g/L Bacto tryptone, 5 g/L Bacto yeast extract, 5 g/L NaCl). Solid cultures were done in tryptic soy agar (TSA, Difco) containing 0.01% (w/v) Congo red (TSA-CR) at 30 °C to ensure the presence of the virulence plasmid in the constructed strains (Schuch and Maurelli, 1997). Ampicillin (100 μg/mL), kanamycin (50 μg/mL), and tetracycline (10 μg/ mL) were added when appropriate. Mutagenesis was performed by the Red/Swap method to create chromosomal mutations by homologous recombination using PCR products (Datsenko and Wanner, 2000). Shigella flexneri 2a strain 2457T containing pKD46, which expresses the λ Red recombinase system, was transformed with PCR products that were generated using as template plasmid pKD4, which contains the FRT-flanked kanamycin-resistance gene (αph). Each primer pair also carried 30 bases that were homologous to the edge of the gene targeted for disruption. The sequences of the oligonucleotide primers used in this study are available on request. The kanamycin-resistant transformants were replica plated in the absence of antibiotic selection at 37 °C and finally assayed for ampicillin sensitivity to confirm loss of pKD46. To obtain non-polar deletion mutants, the antibiotic resistance gene was removed by transforming the gene replacement mutants with pCP20, which encodes the FLP recombinase that mediates site specific recombination between the FRT sites (Cherepanov and Wackernagel, 1995). Correct insertional gene replacements and the deletion of the antibiotic gene cassettes were confirmed by PCR. DNA fragments containing the S. flexneri 2457T wzzpHS2 (NC_002773) and wzzB (GeneID:1077593) genes and their promoter regions were amplified by PCR. The amplicons were cloned into pDA12 (Aubert et al., 2008). The sequences of the primers used for the cloning experiments are available upon request. Large scale LPS preparations from S. flexneri wild type and the O-antigen mutants wzzpHS2::αph and wzzB were obtained by the method of Darveau and Hancock (1983). The quality of the purified LPS samples was confirmed by Tricine-SDS-PAGE as described below. To rule out the presence of proteins, LPS samples were analyzed by SDS-PAGE and proteins were quantified using the Coomassie Plus protein assay kit (Pierce). Proteinase K-digested whole-cell lysates were prepared as described previously (Hitchcock and Brown, 1983), and LPS was separated on 12% (w/v) acrylamide gels using a Tricine-sodium dodecyl sulfate (SDS) buffer system (Lesse et al., 1990). Gel loadings were normalized so that each sample represented the same number of cells as previously described (Bravo et al., 2008). Gels were silver stained by a modification of the procedure of Tsai and Frasch (1982). 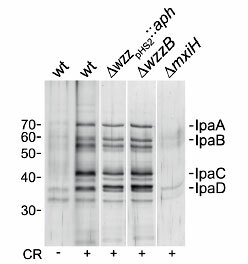 The secretion of Ipa proteins was induced by supplementing bacterial cultures with 20 μg/mL Congo red, as described by Bahrani et al. (1997). After the induction, supernatants were concentrated and the protein samples were analyzed by SDS-PAGE and silver stained. Caco-2 cells (American Type Culture Collection HTB-37), human colonic carcinoma cells, were maintained in high-glucose DMEM supplemented with 10% (v/v) fetal bovine serum (FBS) and non-essential amino acids (GIBCO BRL). Caco-2 polarized monolayers were obtained as follows: 3 µm pore size polycarbonate filter inserts (Millicell, Millipore) were coated with type A Gelatin (SIGMA) for 6 h before cell seeding. Then, 3 x 105 cells were seeded onto the inverted filter inserts and allowed to attach overnight. After that, inserts were placed upright in 24-well culture plates (basolateral side of monolayer upward) and maintained for 7 days in 5% CO2 and 95% air, changing medium every 2 days. Electrical resistance was measured every day using a dual-voltage Ohmmeter clamp until a steady-state transepithelial cell resistance of approximately 400 to 800 Ω/cm was reached. Bacteria were grown aerobically to an optical density at 600 nm of 0.3, washed twice with phosphate-buffered saline (PBS), suspended in DMEM supplemented with 10% (v/v) FBS and added to polarized Caco-2 cells monolayers at a multiplicity of infection of approximately 100. Adhesion assays were performed by co-incubating the monolayers with bacteria for 1 h at 4 °C. Then, each well was rinsed three times with 100 μL of ice-cold PBS and cells were lysed by incubation with 100 μL of sodium deoxycholate (0.5% w/v in PBS) for 10 min. LB (900 μL) was added, and each sample was vigorously mixed to recover adherent bacteria, which were quantified by plating for colony-forming units (CFU) on TSA-CR plates. Adhesion was calculated as follows: percent adhesion = 100 x (number of cell-associated bacteria/initial number of bacteria added). For invasion assays, after addition of bacteria to the monolayers, the culture plates were centrifuged at 180 x g for 10 min and then incubated for 30 min at 37 °C. Cells were washed three times with pre-warmed PBS and incubated for an additional 1 hin DMEM supplemented with 10% FBS and containing gentamicin (50 μg/mL) to kill extracellular bacteria. Cells were then washed three times with PBS and lysed with sodium deoxycholate (0.5% w/v in PBS). Intracellular bacteria were diluted and plated on TSA-CR plates. Invasion was calculated as the number of bacteria resistant to gentamicin/initial number of bacteria added. Invasion and adherence of the wild-type strain was arbitrarily defined as 100%. For competition assays, purified LPS preparations (100 μL) at different final concentrations in PBS were added to polarized Caco-2 cells and incubated for 1 h at 37 °C. Then, PBS was removed and invasion assays were performed as described above. Data were obtained from at least three independent experiments performed in triplicate and were expressed as means ± standard errors. The statistical significance of differences in the data was determined using the one-way analysis of variance (ANOVA) test and the Dunnett's post-test. Defined, non-polar deletions of genes responsible for assembly of the O antigen were constructed. The disrupted genes included: (i) wzzpHS2, encoding the chain length regulator that determines polymerization of the VL-OAg (>90 RU), (ii) wzzB, encoding the chain regulator responsible for polymerization of the S-OAg (11-17 RU), (iii) wzy, encoding the O-antigen polymerase, and (iv) wααL, which encodes the O-antigen ligase; a protein catalyzing the link between O-antigen chain and the lipid A-core region (Schnaitman and Klena, 1993). Fig. 1A shows the LPS patterns of the parental and LPS mutant strains. As previously reported (Carter et al., 2007), strain wzzpHS2::αph (MSF1107) produced O-antigen chains lacking VL-OAg (lane 2), whereas the wzzB mutant strain (MSF1033) did not exhibit S-OAg molecules (lane 3). Mutant wzy (MSF1749) showed a semi-rough phenotype with a very prominent band corresponding to core substituted with one O-antigen unit (lane 4). Finally, the wααL mutant (MSF1210) produced LPS with a complete core region and devoid of O antigen (lane 5). Figure 1: (A) LPS profiles from S. flexneri wild type and its isogenic O-antigen mutants. LPS samples from equal numbers of bacterial cells were loaded in each lane and were analyzed by Tricine/ SDS-polyacrylamide gel electrophoresis on a 12% acrylamide gel followed by silver staining. (B) Adhesion and (C) invasion of S. flexneri wild type and mutants to polarized Caco-2 cells. The assays were performed in triplicate on at least three independent occasions. Averages ± standard errors (error bars) are shown. Values that are significantly different from those of the wild type are indicated by * (p<0.05) or *** (p<0.001). The strains are 2457T (wt), MSF1107 (Δwzz pHS2::αph), MSF1033 (Δwzz B), MSF1749 (Δwzy ), MSF1210 (ΔwααL), MSF252 (ΔmxiH::αph). To evaluate whether the LPS defects of the mutants affected the function of the T3SS, exponential cultures of each strain were incubated with Congo red to induce secretion of the effector proteins, as described in Materials and Methods. A mutant defective in type-three secretion ( mxiH) was also analyzed as negative control. The parental strain and all the O antigen mutants showed the characteristic electrophoretic profile of Ipa proteins (Parsot et al., 1995), indicating a functional T3SS (Fig. 2). Figure 2: Secretion of Ipa proteins by S. flexneri wild type and mutants. Secretion was induced by incubating bacteria with Congo red (CR). Proteins in culture supernatants were electrophoresed and silver stained. The positions of Ipa proteins are indicated. Numbers indicate positions and sizes (in kDa) of standard proteins. To address the role of the O antigen in the initial interaction of S. flexneri with epithelial cells, we compared the abilities of mutants and the wild-type 2457T to adhere to and enter Caco-2 cells as a polarized colonic epithelial cell model. We first investigated the role of O antigen in adhesion. The experiments were done under conditions in which invasion was inhibited by reduced temperature (4 °C) as described in Material and Methods. As shown in Fig. 1B, all the mutants exhibited the same or higher levels of adhesion to Caco-2 cells compared to the parental strain. These results indicate that the presence of O antigen is not required for adhesion of S. flexneri to epithelial cells. The ability of the O-antigen mutants to invade polarized epithelial cells was assayed. A mxiH mutant, which lacks one structural protein of the needle complex of the T3SS, was used as negative control. As shown in Fig. 1C, mutants in the wzzpHS2 or wzzB genes were significantly less invasive than the wild-type strain. This phenotype was also observed for the wzy and wααL mutants. We concluded from these data that entry of S. flexneri into epithelial cells from the basolateral surface requires not only polymerized O antigen but also, most importantly, a modal chain-length distribution of O-antigen molecules contributed by both WzzB and wzzpHS2. To ensure that the defects in O-antigen chain length were responsible for the diminished invasive capacity of mutants wzzpHS2 and wzzB, each mutant was complemented with the corresponding intact gene cloned into the low copy number plasmid pDA12 (Table I). The complemented strains showed wild-type LPS profiles (Fig. 3A). The invasion abilities of the complemented mutants were compared with the parental strain transformed with the vector pDA12. Both strains were able to enter Caco-2 cells as well as the wild type. The complemented wzzB showed higher invasion levels, but the differences with the wild type levels of invasion were not statistically significant (Fig. 3B). Figure 3: (A) LPS profiles from S. flexneri wild type and complemented O-antigen mutants (B) Invasion of polarized Caco-2 epithelial cells by S. flexneri wild type and complemented O-antigen mutants. The assays were performed in triplicate on at least three independent occasions. Averages ± standard errors (error bars) are shown. Values were not significantly different from those of the wild-type S. flexneri. The strains are 2457T/pDA12 (wt/vector), MSF1107/pDAPF2 (ΔwzzpHS2::αph/wzzpHS2+) and MSF1033/pDABF3 (ΔwzzB/wzzB+). 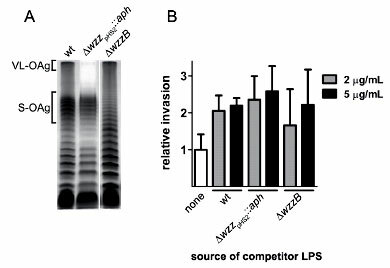 To elucidate whether O-antigen molecules are required for the first interaction with epithelial cells, LPS from the parental, wzzpHS2 and wzzB strains was purified and used as a competitor in the invasion assay. As shown in Fig. 4, pre-treatment of the monolayers with LPS purified (2 and 5 μg/ mL) from any of the three strains did not affect the invasion ability of the parental strain. The same results were obtained when higher amounts of competitor LPS (100 and 1000 μg/ mL) were added (data not shown). These results demonstrated that LPS does not compete for internalization of S. flexneri into epithelial cells by the basolateral membrane, supporting our finding that LPS is not required for adhesion, but rather it would be needed in a later step of the invasion process. Figure 4: Effect of pre-treatment of Caco-2 cells with purified LPS on bacterial invasion. (A) LPS profiles of samples purified from S. flexneri wild type and its isogenic O-antigen mutants. (B) Competition assays. Caco-2 cells were pre-treated with 2 or 5 mg/ mL of LPS obtained from each indicated strain before the addition of wild-type bacteria. Invasion assays were performed in triplicate on at least three independent occasions. Averages ± standard errors (error bars) are shown. Values were not significantly different from that of non treated Caco-2 cells. The role of LPS O antigen in the initial interaction of S. flexneri with epithelial cells is not yet well defined. Earlier studies carried out with HeLa cells indicated that O antigen is not required for S. flexneri invasion (Okamura et al., 1983; Okamura and Nakaya, 1977; Rajakumar et al., 1994; Sandlin et al., 1995). These studies were conducted using mutants that were not rigorously characterized genetically, obtained either spontaneously or by transposon insertions. In any case, secondary mutations and/or polar effects on genes located downstream the mutation site in the wba operon cannot be ruled out. In this work, we dissected the contribution of O antigen to epithelial cell invasion by S. flexneri using mutants with defined deletions of genes for O antigen assembly and polymerization. We found that polymeric O antigen is required for invasion of polarized Caco-2 cells by the basolateral side. Our results are not in accordance to those of Kohler et al. (2002), who reported that the presence of O antigen was not required for the invasion process itself, but it was essential for adhesion. In that study, invasion assays were performed by incubating the monolayer with bacteria at 37 °C for 90 min, then gentamicin was added and incubation proceeded for additional 90 min. After lysis of the monolayer, CFU were counted. To estimate the number of surface-associated bacteria, the invasion values were subtracted from the CFU obtained after the initial 90 min of incubation without gentamicin. So, it is possible that during incubation with gentamicin, intracellular bacteria proliferated. Thus the invasion index was over estimated, lowering the adherence values. In consequence, these experimental conditions could explain why the authors attributed to an impaired adhesion a defect in invasion. Interestingly, we found that polymerized O antigen with a normal chain length distribution, that is, containing S-OAg and VL-OAg, is required for polarized-cell invasion by S. flexneri (Fig. 1). 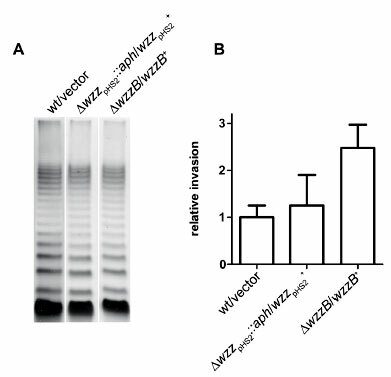 Mutants with deletions of either wzzB or wzzpHS2 were significantly less invasive than the parental isolate. When these mutants were transformed with plasmids containing the corresponding intact gene, the invasive capacity was restored to wild-type levels (Fig. 3). Our results suggest that no direct interaction occurs between O-antigen molecules and a possible ligand on the epithelial cell surface to promote invasion (Fig. 4). The invasion defects of the O-antigen mutants could be attributable to a general compromise of the outer membrane integrity. As the loss of bacterial cell envelope integrity often results in increased permeability and sensitivity to detergents, cationic peptides, antibiotics and other toxic compounds (Nikaido and Vaara, 1985), bacteria were tested for sensitivity to SDS, polymyxin B, EDTA, and novobiocin by the method described by Maloney and Valvano (2006). No differences were observed between any of the mutants and the wild-type strain (data not shown), suggesting that the cell envelope of the LPS mutants remains fully functional. Nonetheless, a normal LPS may be necessary for the assembly or exposure of other surface structure that mediates the entry process. In support of this notion, it has been reported that the O antigen contributes to stabilize the outer membrane by the interaction between adjacent O-antigen chains (Nikaido, 2003), and LPS also interacts with outer membrane proteins allowing their correct localization and function (Goldberg and Theriot, 1995). In S. flexneri, mutants that are devoid of VL-OAg, but not of S-OAg, are highly sensitive to serum (Hong and Payne, 1997). These findings, together with the results of this study suggest that, while the presence of VL-OAg would be optimal for extracellular survival, a normal chain length distribution (S-OAg and VL-OAg) is required for internalization of bacteria into polarized epithelial cells. This work was supported by grants ADI-08/2006 from CONICYT/World Bank (to I.C.) and from the Canadian Institutes of Health Research (to M.A.V.). A.H. was supported by a CONICYT Scholarship. M.A.V. holds a Canada Research Chair in Infectious Diseases and Microbial Pathogenesis. Received: May 24, 2011. In revised form: August 16, 2011. Accepted: August 20, 2011.